While the color blue brings up visions of the sky and water, it is also one of the favorite colors for men's gemstone rings. Mens blue gem wedding rings have always sustained a high demand, sapphire wedding rings for men, aquamarine rings and ofcourse blue topaz men's wedding rings in gold or silver lead the gem stone choice in this category. Since there are many blue gems, it is interesting to understand how the selection of a blue gem for a yellow or white gold wedding ring is made. For example, birth stones like blue topaz, blue sapphire and aquamarine can be used to create blue gem birth stone wedding rings for men. Though men's birth stone wedding rings are not very rare, it has been found that most men select the gem stone for their ring based on color choice. 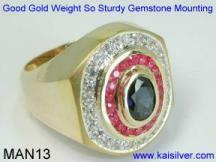 There are a few gem stone features that will determine how durable your blue gem stone ring is. Wearing your ring in a physically harsh environment could affect some blue gems. 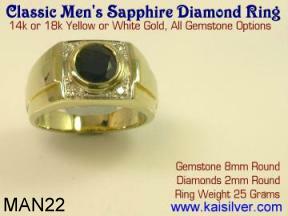 Keeping longterm durability as an objective we would make a few recommendations for men's wedding rings with blue gems. A short paragraph will also explain why we excluded some of the other blue gem stones from this list. Blue Sapphire: While we would not rate this as the lowest priced blue gem stone in our list, it surely is the most durable of the blue gems. Both yellow and white gold sapphire men's wedding rings have always shown a robust demand. The gem has a hardness of 9 which in gemological terms is second only to diamonds which are rated as the hardest stones used in jewelry. This would also be a September birth stone wedding ring and will therefore have enhanced significance if you were born in the month of September. Like most other gems, blue sapphires are priced per carat but prices of sapphires rise sharply as the gem stone size increases. There was a time when the finest looking blue sapphires came from Ceylon. While Ceylon sapphires are still priced quite stiffly, the quality of the gems that come out of the mines today leave much to be desired. Good looking blue sapphires that are good value for the money paid can be sourced from Madagascar and sometimes from Thailand too. Sapphires in general are expensive, they are available in different grades and price tags reflect the grade. Unless you are blessed with a very liberal budget, go for the medium grade blue sapphire option. If you stay in the 2 to 3 carat range you can expect to find a good mens gold wedding ring with blue sapphire, at a price that will not be too hot for your wallet. Aquamarine: This March birthstone is also quite durable at around 8.5 on the hardness scale. However, the color of aquamarine is always very pale so do not expect a pronounced blue sapphire like color. This gem stone is much cheaper than blue sapphires and sizes even in the 3 to 4 carat range can be quite affordable. While white gold aquamarine wedding rings are popular with ladies, most men's aquamarine wedding rings can be seen in yellow gold. A very pale blue version of topaz also called sky blue topaz, can sometimes be confused with Aquamarine. Make sure that your jeweler gives you a natural aquamarine if that is what you paid for. However if you are interested more in the color shade of Aquamarine rather than being particular in the gem stone being an aquamarine, the much cheaper sky blue topaz is a great choice. Remember that while you will have to make do with a pale blue aquamarine, there is no need to compromise on clarity of the gem. Eye clean aquamarine gems are not very tough to find, so insist that you get one such aquamarine for your gold or sterling silver men's wedding ring. Blue Topaz: Surely the most affordable gem stone option among the stones being discussed for your men's blue gem wedding ring. Blue topaz is recognized as the December birth stone along with turquoise. 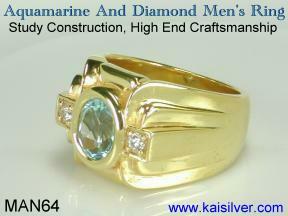 Almost as durable as aquamarine, this gem is commonly set in gold and 925 silver men's wedding rings. If you prefer to get a blue gem ring with a blue topaz you will be blessed with three interesting blue shades to choose from. The palest shade of blue topaz could resemble the color of a good quality aquamarine, ofcourse at a much lower price. However if you really like the blue color of topaz, it will be the brighter swiss blue topaz or the deep majestic blue of London blue topaz that will most certainly be your choice. Neither of these gems is very expensive, so the color choice should be the deciding factor. There is one more reason why you might want to consider a mens blue topaz wedding ring and this is when, you need a ring that has a large blue gem probably as large as 5 to 8 carats. Neither sapphire nor aquamarine would be too price friendly in this size range. A special note about the majestic london blue topaz. Mens rings with this gem stone somehow appear to be worth far more than the price tag would suggest. This gem looks more in the league of the more expensive gems like, blue sapphire and iolite. Not Recommended: Here are some blue gems that are not highly recommended for a blue gem men's wedding ring. This is based more on factors related to durability rather than anything else. The fact that men do not take too much care of the jewelry that they wear is also taken into consideration. Blue lapis, is a dark blue gem that is opaque and quite cheap. This gem does not score too high on durability and can get scratched or cracked quite easily. If you still find many blue lapis men's wedding rings, it is probably because jewelers never care to explain the facts to buyers. Blue turquoise in it's natural condition is not quite durable, this is one reason why a process to produce stabilized blue turquoise has been developed. However care and caution is required when wearing, storing or cleaning blue turquoise (both natural and stabilized). Since you cannot expect men to fuss too much over their jewelry, it is a good idea to leave blue turquoise out. 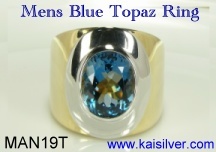 If you need to have a December birth stone in your men's wedding ring, try any shade of blue topaz instead. In recent years, many well known jewelers and Television shopping channels have pushed blue apatite jewelry. When a greenish blue apatite is heated at a specific temperature, some of the stones turn to a blue that is void of the greenish color tint. Blue apatite is a very weak gem and really should not be used in jewels like rings. Pendants which have lower wear and tear can probably be made with blue apatite gems. The above information is not fiction or sales talk, it is something that is very relevant to anyone considering a blue gem stone ring. Unfortunately, few jewelers care to provide buyers with such detailed information. On the contrary honest jewelers like Kaisilver are criticized forf the way in which they educate buyers. Most jewelers agree that an ill informed buyer can be pushed to make a purchase, a well informed buyer will do a logical evaluation before making a purchase. Keep the above information in mind, we are not here to push you to purchase from us. Just use the information and make a rational and informed buying decision. Here are a few suggestions for a mens blue gem stone wedding ring. Kaisilver has kindly agreed to provide these images and we do hope that you will find them to be interesting and helpful. You can use this information to help find the best source for your blue gem stone wedding ring, it is not necessary that you place your order with Kaisilver. 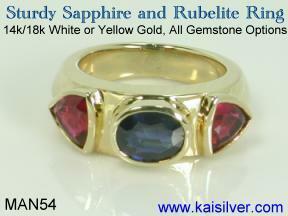 All jewelry at Kaisilver is custom made with good metal weight and craftsmanship. You can choose the design, dimensions, gems and metal for your custom jewelry. This means that any of these designs shown below or any of the jewelry from the Kaisilver group of websites can be ordered in gold or sterling silver with the gem stone of your choice. 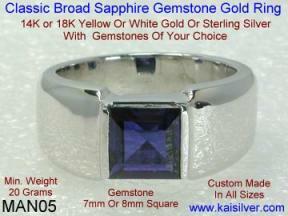 Kaisilver one of the finest online custom jewelry provider offers custom made jewelry in gold or sterling silver. We can custom make your jewelry with a design sent by you or chosen from our collection. Gold or silver custom jewellery is given equal attention by our skilled artisans. You can choose the gemstone of your choice and also specify dimensions for your jewelry. Our expert team at sales@kaisilver.com will be glad to provide you with suggestions and advice that you might need.